Trump And Democrats Seek Common Ground On Drug Prices : Shots - Health News Two congressmen met with President Trump seeking support for a bill to expand the government's ability to negotiate drug prices. But it's not clear it would have much impact or will gain support. Rep. Elijah Cummings, D-Md., listens as Rep. Peter Welch, D-Vt., speaks to members of the media Wednesday outside the West Wing of the White House in Washington following their meeting with President Trump. 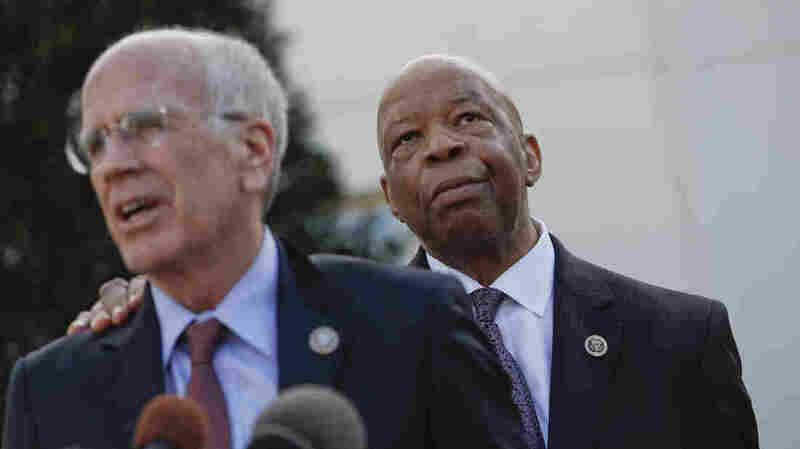 On Wednesday, U.S. Reps. Elijah Cummings (D-Md.) and Peter Welch (D-Vt.) met privately for about an hour with Trump and his newly appointed HHS secretary, Tom Price, to discuss ways to combat high drug prices. They were joined by Dr. Redonda Miller, president of Johns Hopkins Hospital. The Congressmen pitched a House bill that would expand the federal government's ability to negotiate drug prices, and they left feeling optimistic about what Trump will do. "He made it clear to us that he wanted to do something," Cummings said, characterizing Trump as "aware of the problem" and "enthusiastic." 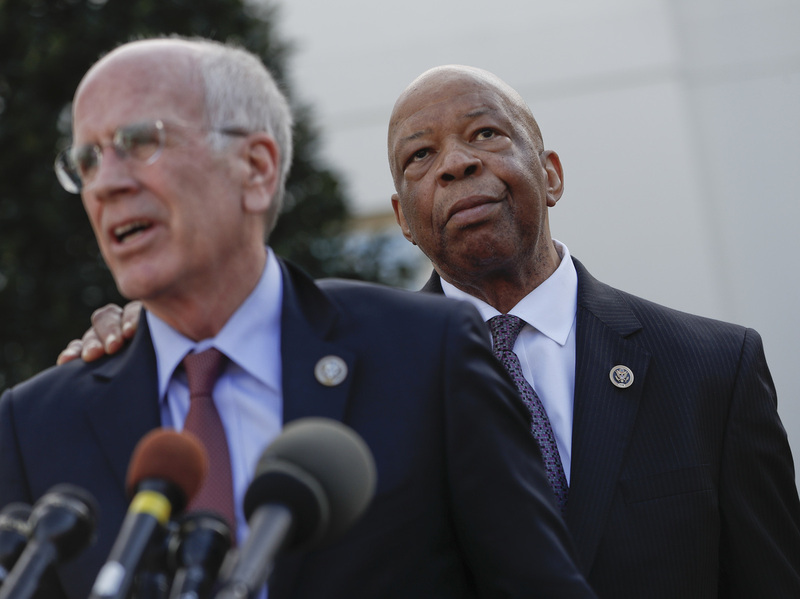 Cummings is ranking member of the House Committee on Oversight and Government Reform. Trump tweeted the day before his meeting with Cummings and Welch that he is "working on a new system where there will be competition" in the drug industry. After the meeting, the president relayed his desire to work "in a bipartisan fashion to ensure prescription drug prices are more affordable for all Americans." Allowing the federal government to negotiate drug prices is not a new idea, but Cummings and Welch painted a picture Wednesday of a political landscape that is ripe for change. They said they have a president who "gets it." And, Welch said, "the price is starting to kill us, we just can't afford it." The lawmakers said they handed Trump and Price the most recent draft of the bill for their review and to make comments. Cummings said he hopes to file the bill in two weeks. A summary posted on the House committee website, said the proposed legislation would enable HHS secretary to negotiate lower prices with drug manufacturers under Medicare Part D, which provides coverage for prescription drugs bought at pharmacies. An estimated 41 million Americans are covered by Part D. The drug benefit is provided through private insurers who each have their own formulary (a list of allowed drugs) and generally use pharmacy benefit managers for drug purchasing. The latest proposal would direct the HHS Secretary to establish a formulary. The formulary would be used to "leverage" the purchasing power of the government, according to the summary. Douglas Holtz-Eakin, a former director of the Congressional Budget Office and now president of the American Action Forum, said the idea of lowering prices through Medicare Part D negotiations is "completely unrealistic." Holtz-Eakin points out that insurers are already used to managing health care for beneficiaries and there are formularies in those plans. Adding into the law that the HHS Secretary should be part of the negotiations merely adds a "bully pulpit," he said. "The problem with the negotiation in Part D is not a political, partisan problem — it's that it won't work," said Holtz-Eakin, adding that the Medicare Part D program is already holding prescription drug costs down because of the negotiating ability of the drug plans. Trump himself, though, has long embraced the idea of Medicare negotiating drug prices. On the campaign trail in January 2016, he reportedly told a crowd in New Hampshire that Medicare could save a huge amount of money by getting discounts, as the biggest buyer of prescription drugs. "We don't do it," Trump said that day, according to the Associated Press. "Why? Because of the drug companies." PhRMA, the drug industry's powerful lobbying group, says price negotiation is already happening. "Large, powerful purchasers negotiate discounts and rebates directly with manufacturers, saving money for both beneficiaries and taxpayers," PhRMA's Holly Campbell said Wednesday, in an email. She pointed to a Congressional Budget Office report that said HHS would not be able to negotiate lower prices than already exist. Trump met with pharmaceutical executives in January and told them, "We have to get prices down for a lot of reasons. We have no choice." Umer Raffat, a research analyst at Evercore ISI, said the industry felt less jittery after that meeting. They walked away understanding that President Trump wants to "promote innovation" while addressing prices. Sarah Jane Tribble is a senior correspondent at Kaiser Health News, an editorially independent newsroom that is part of the nonpartisan Henry J. Kaiser Family Foundation. KHN's coverage of prescription drug development, costs and pricing is supported in part by the Laura and John Arnold Foundation.